Perfectly matches and blends with leading shades, even salon colour. From light blonde to black hair. Lasts until washed out. No transfer, lightweight formula. Up to 30 uses.The pinpoint micro-diffuser precisely targets greys and the rich colour pigments give you perfectly blended coverage. 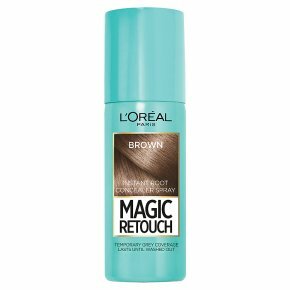 Our 1st instant root concealer spray, Magic Retouch conceals greys and roots in just one quick spray - when, where and how you need it. 3 seconds to flawless roots! Shake well before use. Keep the product upright. Apply to dry, styled hair. Hold can approximately 10cm from hair & spray roots in a light stream. Don't overspray. A small amount is enough. Allow to dry before touching your hair.